1771 Bonne Map of Abyssinia (Ethiopia), Sudan and the Red Sea. WE SELL ONLY ORIGINAL ANTIQUE MAPS - NOT REPRODUCTIONS JOIN OUR WEEKLY MAILING LIST FOR NEWEST STOCK. 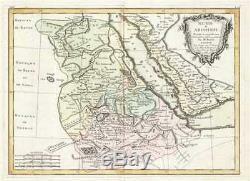 Description: This is a 1771 Rigobert Bonne map of Nubia and Abyssinia. The map depicts from Aswan, Egypt to modern-day Ethiopia and from modern-day Sudan to Saudi Arabia. The modern-day countries of Eretria, Djibouti and Somalia are illustrated and border the Red Sea, which is labeled. This is a fairly advanced map revealing the cartographic sophistication of the Abyssinian Empire. The Blue Nile is illustrated flowing correctly into Lake Dambea (Lake Tana) from the south. Numerous important cataracts on the Blue Nile are labeled. The White Nile, whose course is more mysterious, acts as a kind of western border for this map, with only vague notations regarding the African empires lying on its western shores. Numerous Nubian and Abyssinian cities and monasteries are labeled, along with Mecca across the Red Sea. A decorative title cartouche is situated in the upper right corner. Drawn by Rigobert Bonne in 1771 for issue in Jean Lattre's Atlas Moderne. Size: Printed area measures 11.5 inches high by 16.25 inches wide. If your address is a P. DHL International EXPRESS (45 USD). We can use your Federal Express Account. Duty varies by country and we cannot predict the amount you will be charged. Some countries are duty free, others are not. Additional Services Conservation Framing Services: Geographicus recommends basic conservation framing services for any antique paper. We do not offer this service. Antique Map Restoration Services: Geographicus can repair and restore your antique map. Services include deacidification cleaning flattening and backing. The item "1771 Bonne Map of Abyssinia (Ethiopia), Sudan and the Red Sea" is in sale since Thursday, September 20, 2018. This item is in the category "Antiques\Maps, Atlases & Globes\Africa Maps". The seller is "geographicusmaps" and is located in 11221. This item can be shipped worldwide.